Yeast is a form of Fungi used that has been used for centuries for levening in baking and fermenting alcohol. Buying: Today there are several retailers of baker's yeast; one of the best-known in North America is Fleischmann’s Yeast, which was developed in 1868. During World War II Fleischmann's developed a granulated active dry yeast, which did not require refrigeration and had a longer shelf life than fresh yeast. The company created yeast that would rise twice as fast, reducing baking time. Baker's yeast is also sold as a fresh yeast compressed into a square "cake". Alcoholic beverages are defined as beverages that contain ethanol (C2H5OH).Beverages such as wine, beer, or distilled spirits all use yeast at some stage of their production.Yeast, most commonly Saccharomyces cerevisiae, is used in baking as a leavening agent, where it converts the fermentable sugars present in dough into the gas carbon dioxide. This causes the dough to expand or rise as gas forms pockets or bubbles. When the dough is baked the yeast dies and the air pockets "set", giving the baked product a soft and spongy texture. The use of potatoes, water from potato boiling, eggs, or sugar in a bread dough accelerates the growth of yeasts. Yeasts are able to grow in foods with a low pH, (5.0 or lower) and in the presence of sugars, organic acids and other easily metabolized carbon sources. During their growth, yeasts metabolize some food components and produce metabolic end products. This causes the physical, chemical, and sensible properties of a food to change, and the food is spoiled. 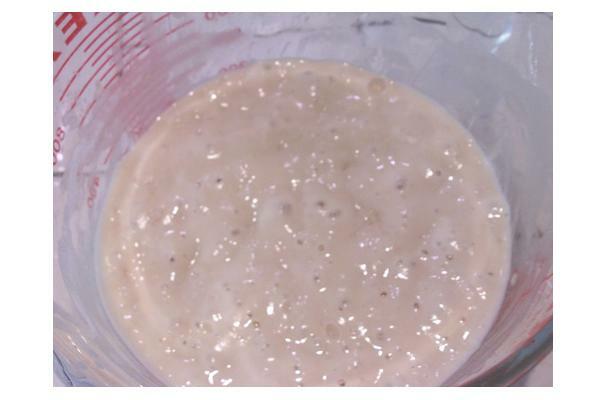 The growth of yeast within food products is often seen on their surface, as in cheeses or meats, or by the fermentation of sugars in beverages, such as juices, and semi-liquid products, such as syrups and jams. The word "yeast" comes to us from Old English gist, gyst, and from the Indo-European root yes-, meaning boil, foam, or bubble.Yeast microbes are probably one of the earliest domesticated organisms. People have used yeast for fermentation and baking throughout history. Archaeologists digging in Egyptian ruins found early grinding stones and baking chambers for yeasted bread, as well as drawings of 4,000-year-old bakeries and breweries.